I hope everyone had a wonderful Easter! The weather in our corner of the state was glorious! We've been collecting really well-priced gallon perennials for a few weeks now, and also found some astounding plants on a recent Costco run, so we decided it was perfect weather to get them in the ground! All of these photos were taken in the late afternoon, so please forgive the shadows. 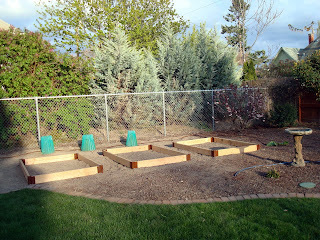 Here are the raised beds we put up last year. I can't believe how big the Arborvitae have gotten in one year! Those blue, cone-shaped "sculptures" are water walls for Mr. Squash's New Jersey tomato seeds. They keep the soil warm and allow you to plant your tomato starts weeks early - even befor the last frost! And yes....there are tomatos inside of them! 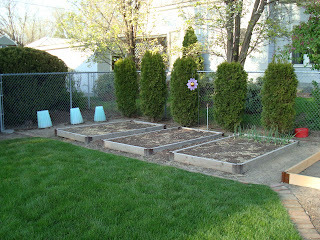 This year we added three more raised beds to the right of the existing beds. We had to take down some very old junipers that had gotten out of hand and begun rotting. While they were gorgeous to look at from one side, they were beginning to block the light to the vegetables. When we took them down we not only had room for more beds, we can now enjoy our elderly neighbors gorgeus trees and ancient lilac! They also act as a complete prviacy screen! Later this week we'll be filling the beds with composted soil. 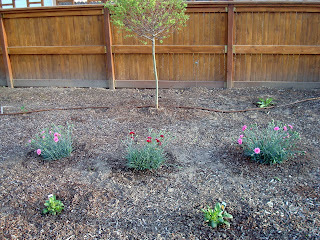 The area to the left of the birdbath will be full of lavender and marigolds! Oh - and Mr. Squash repaired the birdbath which had cracked so bad from the winter cold that it would not hold water! Carnations are some of my favorite flowers - I also think they are my birth month flower. These mature beauties came from Costco! They will bloom clear through August. In front are yellow cosmos, behind is our Hakuro Nishiki Willow we planted last fall. It's leaves are just coming out and not in full splendor as yet. 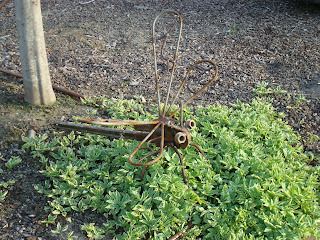 We've also been collecting garden art! 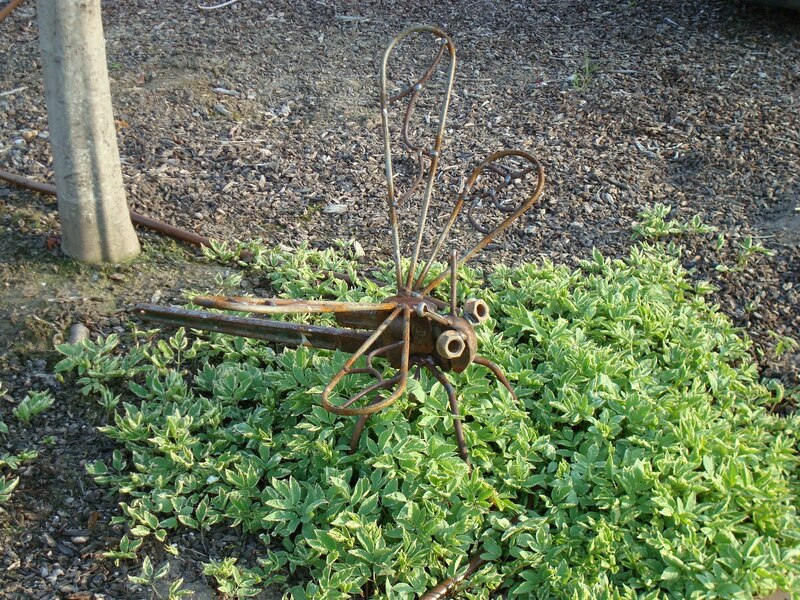 This dragonfly was made out of an old wrench and other spare parts! A local retired farmer turned artist makes these - this is the smallest - he has made life-sized dinosaurs, too! 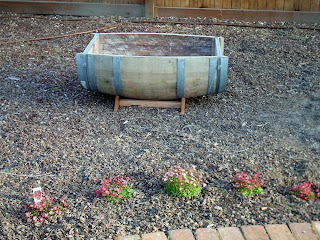 This half wine barrel is going to be my herb garden this year. I planted Saxifrage in front - as they mature they will totally fill that area! See the brown drip line behind the barrel? We decided to have all the drip line in the backyard replaced this year (150 ft). I remember saying to Mr. Squash that it would be nice if they would invent brown drip line which blends better than black. When the irrigation fellow came - his name is Rains -- how fitting, out of his truck came a huge roll of brown drip line! It was meant to be! Here is a wider view of part of my planting area. There is a lot more to put in there, and in a few weeks you won't recognize this view! The short, light tan plant to the back in a very old nine-bark. We cut it back this far each year, but by mid-summer it will be 15 feet tall! Behind it is an Oregon Grape and a small holly. To the right I planted a white Buddleia (Butterfly Bush), and some of the plants in the middle are Astilbe, Bleeding Heart, Sedums, Stella d'oro Day Lily, Heuchera, Gallardia. At the moment I can't think of them all. 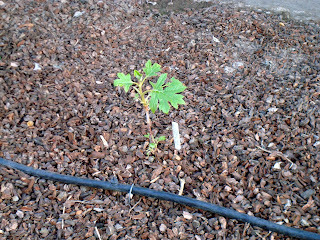 Again...there are more to be planted! Another phenomenal find at Costco was mature Blueberry bushes! We got three - two Jersey and one Duke. They have tons of buds each which are sure to bring us some ripe fruit this summer! I also have some climbing plants that will be placed along the fence line. What's this, you say? 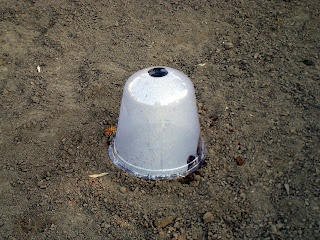 It's a small blueberry bush start that I felt needed to stay under a cloche until the weather got just a tad warmer. It works similar to the water walls - there is a vent at top which can be opened and closed. Moving around to the front of the house...we lost all of our azaleas this winter so we found some gorgeous replacements at Costco! The Columbine next to it was planted last year and absolutely thrives in this spot! I ordered another Columbine from Audobon which is planted in the pot you see along with some Creeping Jenny. There were three Hostas in front - one you can see on the left is coming back, another in front of the white marker is just beginning to show, but the third is lost, so I planted another one in it's spot. This is the north side of the house - not an easy spot to grow anything! I have yet to plant the window box to the right of the front door. 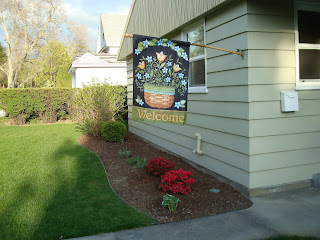 I just love our new spring flag! Here I planted two more Azaleas, another Hosta, and you can see to the left of the Azaleas the three lavenders I planted last summer that are making a comeback. We lost a huge Euonymous to the right of the round shrub whose name escapes me at the moment, so I planted a rare, red, Oakleaf Hydrangea! This is a closeup of the Hydrangea. Not much now, but it is supposed to get quite large! Next post I'll show you some "finds" from our digging! Gosh everything is so neat and just think how gorgeous when it's all filled in. Let me know when the blueberry pie is ready. I'll be over! Your garden looks so perfect and well planned! We are still waiting for the last snow to thaw ... Our Jersey tomatoes are showing the 2 first leaves, still indoors naturally. I can really see that you have spent a lot of time in your garden. All your labor will be worth it in a few weeks. Isn't it amazing what you find at Costco! I can't wait to get things in my garden, but I'm still looking for spring. I thought I saw it Sat, but got up Sunday and realized I was mistaken. Your yard and gardens are going to be bountiful and beautiful this year. Your yard is coming along nicely! I am glad to see that you used the wall o waters because this weather is teasing us...spring one day and back to winter the next. 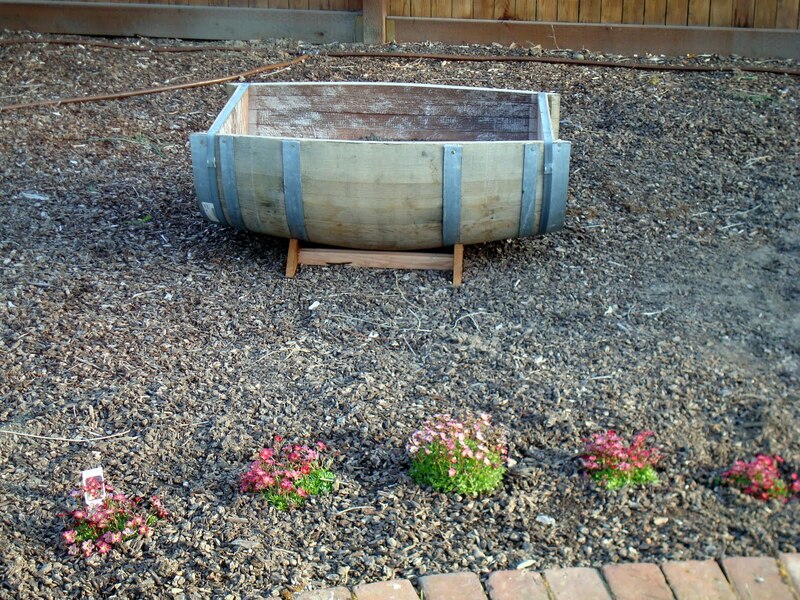 I am loving that barrel for the herb garden idea! I am going to suggest just one thing...if you have astilbe where the butterfly bush is I think you should move it to a shadier spot like where you had your azaela's. Butterfly bush loves sun but not astilbe. Costco can be a great place to find deals on plants! Can't wait for more garden reports! Gardens are gorgeous!!! I long to be working in mine!! You are so lucky!! I love everything you planted. AND tomatoes already?? Awesome! Love it! 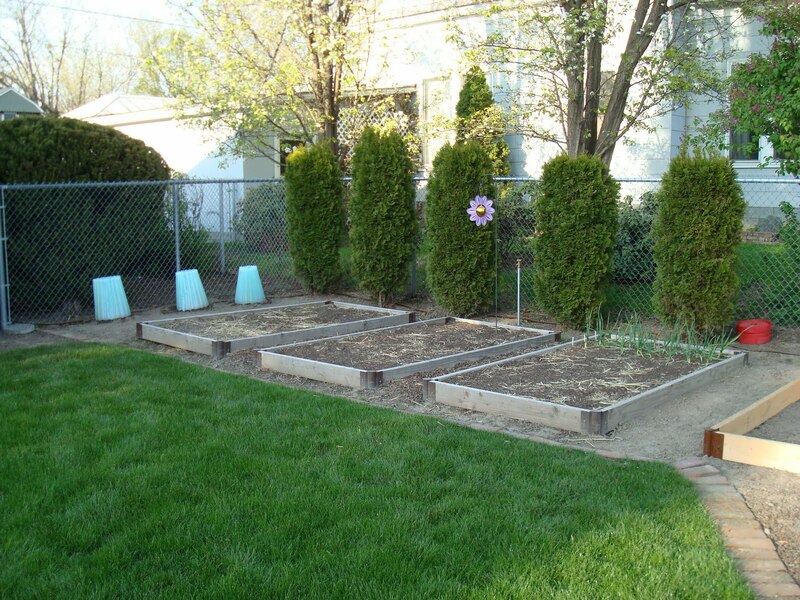 I can't wait to get my garden planted. I think it'll still be a while since we woke up to snow this morning. I think I covet that wine barrel planter *s* I have only seen them 'sliced' the other way - but this is a MUCH more useable piece. Counting the days until I can get diggin'! 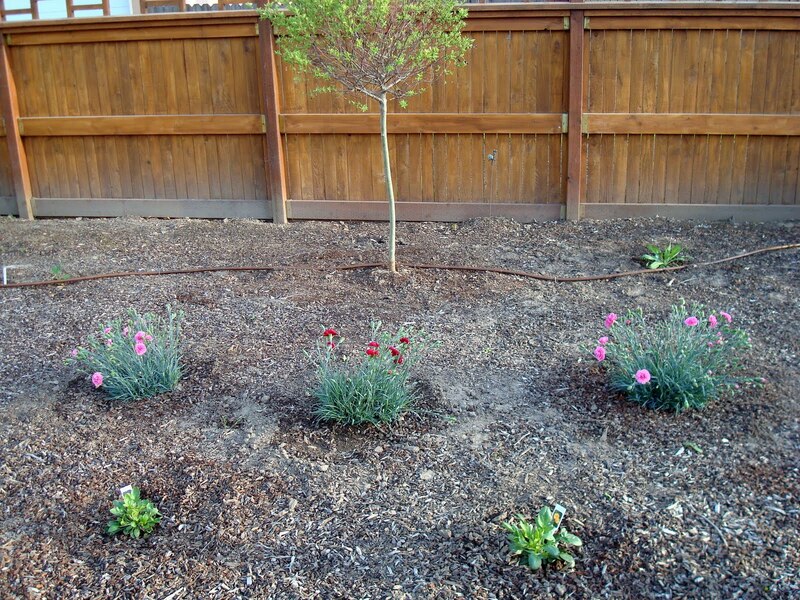 Candace, your flower beds and vegee garden look so good. All my plants freeze but luckily everything has come back. I have the oak leaf hydragnea and it will give you many shoots for you to transplant. enjoy. You guys amaze me. I love seeing what you do. I'm always amazed by your garden posts. And your knowledge of plants, and what and when to plant. I'm told that I've already waited too late to plant tomatoes here. I'll just have to enjoy pictures of yours! I can't wait to see pictures of it all in a couple of months! Looks wonderful! You and Mr. Squash have been a little busier planting, building and fixing than we have here in Nova Scotia, Candace. Our nurseries and garden centers haven't received all of their stock as yet but they should be in high gear if not by this weekend then the next for sure. Since we aren't fenced in here we have to be very careful of what we plant where because of the deer. They eat everything in sight. 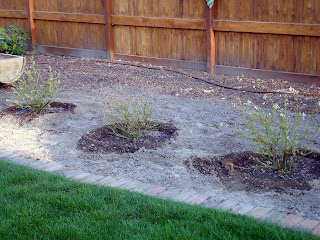 We also planted 3 blueberry bushes...an early, middle and late. The grower advised us to pinch off the blooms this year in order to transfer the energy to the roots to make them stronger, faster. Ours are Duke, Patriot and the third name escapes me. 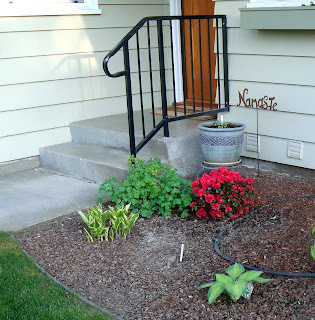 Your garden and flower beds look awesome. I can't wait to see the progression throughout the spring and summer months. Save me some New Jersey tomatoes, Bob! Yummo! 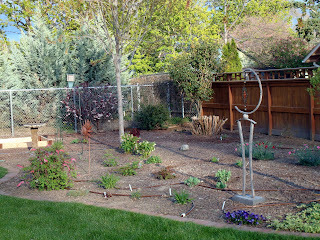 Your garden is going to look gorgeous in Summer! I've a lavender hedge to replant this week and have already replaced some herbs. Oh, your gardens are going to look great when things really warm up. I bet you get a big harvest. Our blueberries are full of flowers this year. No late frost this year. Yippee! Love your yard art too. I have an Oak Leave Hydrangea but it is white. Well it is officially here. Look out for fresher air, more flowers, and the sound of lawnmowers, the smell of grass clippings, bicyclists, garage sales and trips to the garden centre. Your post is really very helpful. I am much pleased to visit your post. Thank you for taking time to discuss such a beautiful post. Ode to the 60's Supreme Sewing Project! Honey....Have you seen my Canoe Shirt? Who was Fuzzy - Winner! April Fool's Day Giveaway Contest!